Flying, scratchboard, 10 x 8 in., 2018. Reference photo by Sandy Scott and kindly used with permission. 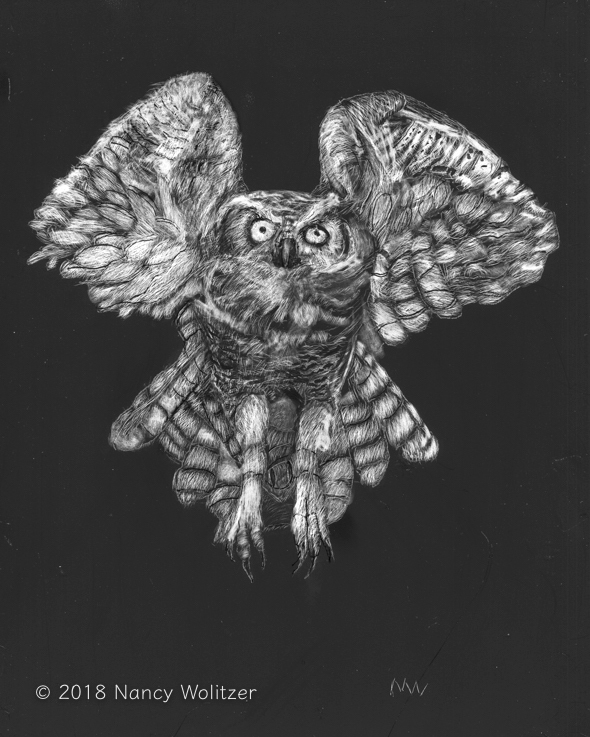 This is a scratchboard of a great horned owl in flight. I think I will now take a break from owls. 18 Sep	This entry was published on September 18, 2018 at 6:21 pm. It’s filed under Artwork, Drawing and tagged Artwork, Drawing, Nancy Wolitzer, Owls, Raptures, Scratchboard. Bookmark the permalink. Follow any comments here with the RSS feed for this post.